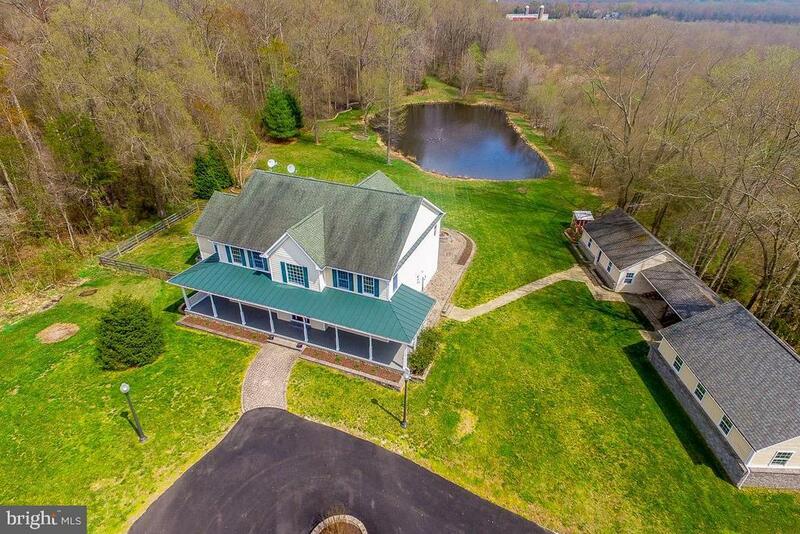 AMAZING CUSTOM HOME W/OVER 7500 SF AND FEATURING FABULOUS WRAPAROUND PORCH ON B-R-E-A-T-H-T-A-K-I-N-G 10-ACRE LOT!! ***4/6 BEDROOMS ON 3 FINISHED LEVELS WITH OVERSIZED ROOMS THROUGHOUT***STUNNING VIEWS ABOUND, FROM YOUR SPECTACULAR POND STOCKED FOR FISHING, TO YOUR PRIVATE PARADISE BACKING TO 370 ACRES OF WILDLIFE PRESERVE***GORGEOUS OPEN FLOORPLAN EXUDES GRACIOUS COMFORT AT EVERY TURN, FROM YOUR GOURMET KITCHEN WITH BREAKFAST BAR, TO YOUR HUGE GREAT ROOM, TO YOUR SITTING ROOM OVERLOOKING YOUR CUSTOM PATIO AND FIREPIT ADJACENT TO THE POND, TO YOUR MASSIVE OWNERS SUITE, TO YOUR SPANSIVE LOWER LEVEL WITH WET BAR AND MASSIVE FAMILY ROOM, AND SO ON*** COUNTLESS RECENT UPGRADES INCLUDING NEW TOP OF THE LINE SS APPLIANCES AND WASHER/DRYER, NEW PLUSH CARPETING, NEW CUSTOM/NEUTRAL PAINT THROUGHOUT ENTIRE INTERIOR AND FRONT PORCH, NEW UPPER LEVEL HVAC UNIT (SECONDARY UNIT REPLACED WITHIN LAST FEW YEARS AS WELL), NEW SHOWER DOORS, NEW POND FOUNTAIN, NEW FENCING AT FRONT OF HOME AND SIDE YARD, NEW WINDOWS AND FRAMES IN GYM OUTBUILDING, NEW SIDING AND WINDOWS IN OUTDOOR SHED/STORAGE BUILDING, BRAND NEW $25K ASPHALT DRIVEWAY, INGROUND PROFESSIONAL BASKETBALL HOOP***COMCAST GIGABIT INTERNET ACCESS BROUGHT IN TO PROVIDE THE HIGHEST STANDARD OF PERFORMANCE***OUTBUILDINGS INCLUDE HUGE GYM/WORKOUT FACILITY, LARGE STORAGE BUILDING/SHED, CHICKEN COOP, AND MORE***LOOK NO FURTHER....PARADISE FOUND!! !